Last year critics of the Large Hadron Collider – a $multi-billion scientific experimental plant based near Geneva, tried unsuccessfully to obtain an injunction at the European Court for Human Rights to prevent it being turned on, because, they claimed, it could destroy Earth. A year or so later their worst fears appear not to have been realised. Patrick Hay interviewed Dr. Geoffrey Dobson to find out everything you need to know about the Large Hadron Collider. Dr Dobson, what are particle accelerators, and what are they for? Particle accelerators are huge expensive machines in which physicists bash sub-atomic particles into each other at high speed, hoping that by studying the results of the collisions they might discover the answer to the ultimate questions about the universe (like how did it all begin and how will it end). 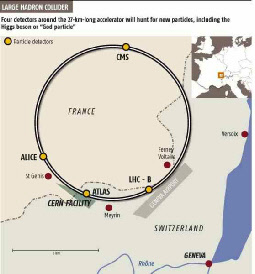 What’s special about the Large Hadron Collider and why was it built, mostly in France, near Geneva? 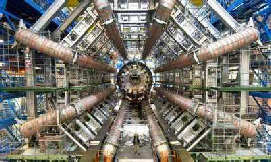 The Large Hadron Collider (LHC) is the latest and greatest particle accelerator. 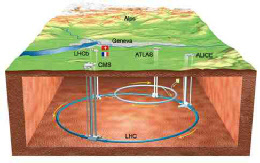 It consists of a 27 km long circular tunnel built 100 metres underground at Geneva that cost 10 billion euros to build. Plans for a super-collider in the USA were cancelled in the 1980s because of the escalating high costs. After a long debate Europe finally agreed to build the LHC. When UK physicists asked the government to chip in a contribution to the project, William Waldegrave (then minister for science in the Thatcher government) offered a crate of expensive wine to anyone who could explain on one sheet of paper what the hell it was for. I do not know if anyone won the prize but the government did cough up the funds. Some critics have warned that the LHC will bring about the destruction of the earth? What are they talking about? produced black holes it would have happened by now. It has even been suggested that we could create new parallel universes within the LHC. Of course we would not be aware of this because once created such a parallel universe would develop in its own space-time bubble without disturbing us. This sounds like science fiction, but quantum mechanics really is weird sometimes! Why are these particle accelerators, and particularly the Large Hadron Collider, so expensive to build and run? And, anyway, what is a Hadron? Hadrons are the particles like protons and neutrons that make up an atomic nucleus. The Large Hadron Collider creates proton-proton collisions at very high energy. Particle accelerators consist of a large number of enormously powerful electro-magnets arranged in a circle inside a very long tunnel. Beams of these sub-atomic particles can be accelerated around this tunnel, to speeds close to the speed of light, guided and contained by the magnetic field. Two beams of particles travelling in opposite directions round the tunnel can be made to collide with one another, but the particles are so tiny that it’s like firing needles from 100 km apart with such precision that they crash! It’s enormously expensive to build because of the scale of the structure, the complexity of the control equipment and because the giant electro-magnets have to operate in a “super-conducting” state. This means they can conduct electricity without resistance or loss of energy. To do this they have to be made from coils of special cable and, while operating, to be chilled to a temperature colder than outer space. To make this possible, the accelerator has to be cooled by a giant refrigerating system filled with liquid helium. The LHC was started up with much media ballyhoo a year ago. Since then, nothing. Why? The LHC started up in September 2008. However it collapsed a few days later when an electrical fault caused a spark that ruptured the helium supply tank. As a result 53 of the magnets overheated and were totally destroyed. Since then all these have been replaced and everything else in the magnet ring has been completely overhauled with lots of new safety over rides, at a cost of further millions of euros. It has just started up again so everyone is keeping their fingers crossed that they have eliminated the cause of the problems. So, how would you try to answer the Waldegrave question? Well, one thing that the LHC scientists hope to find is the “Higgs Boson”, otherwise known as the “God Particle”. In quantum mechanics all forces must be associated with energy-transferring particles called “bosons”. Scottish theorist, Peter Higgs, invented his boson in 1964 to explain how, in the first few seconds after the Big Bang, energy could have converted to particles having mass. Theoretically, without the Higgs Boson our material universe would not exist, hence it got its nickname. Of course until they find it the whole thing is just a theory that may be totally wrong. The Higgs Boson should be detectable at the energies produced in the LHC, but if they don’t find it much of modern quantum mechanical theory will need a rethink. Yes, they also hope to find “super symmetric” particles that only exist at very high energies. “Super Symmetry” theory is a very compelling idea that promises to unite all the forces and particles of the universe in one “Grand Universal Theory”, otherwise known as “The Theory of Everything”. So far no one has ever found a boson corresponding to the force of gravity. Super Symmetry requires the existence of particles called “gravitons” that give rise to gravity. It is a beautiful piece of mathematics, but is it true? When astrophysicists counted up all the matter that they could find in the universe and compared it with the predictions of Einstein’s Theory of General Relativity, they found they could only account for 4 percent of the matter needed to make the universe stable. To explain the fact that 96 percent of the required matter is unknown and undetected by us, they invented the idea of “dark matter” and “dark energy”. Dark matter and energy must, they theorise, permeate the whole universe but not react with any known detection systems other than through the gravitational forces they exert. We haven’t got a clue what they are but the “super partners” predicted by Super Symmetry theory would seem to have the right properties. So would that give us the answer to “Life, the Universe, and Everything”? If Super Symmetry theory turns out to be true it will rank as one of the most important advances in modern physics and there will be Nobel Prizes galore. However, Stephen Hawking has made a bet that whatever we do find in the LHC will be a surprise, and cause physicists to rethink most of our current theories.